Born on January 4, 1643, in Woolsthorpe, England, Isaac Newton was an established physicist and mathematician, and is credited as one of the great minds of the 17th century Scientific Revolution. With discoveries in optics, motion and mathematics, Newton developed the principles of modern physics. In 1687, he published his most acclaimed work, Philosophiae Naturalis Principia Mathematica (Mathematical Principles of Natural Philosophy), which has been called the single most influential book on physics. Newton died in London on March 31, 1727. On January 4, 1643, Isaac Newton was born in the hamlet of Woolsthorpe, Lincolnshire, England (using the "old" Julien calendar, Newton's birth date is sometimes displayed as December 25, 1642). He was the only son of a prosperous local farmer, also named Isaac Newton, who died three months before he was born. A premature baby born tiny and weak, Newton was not expected to survive. When he was 3 years old, his mother, Hannah Ayscough Newton, remarried a well-to-do minister, Barnabas Smith, and went to live with him, leaving young Newton with his maternal grandmother. The experience left an indelible imprint on Newton, later manifesting itself as an acute sense of insecurity. He anxiously obsessed over his published work, defending its merits with irrational behavior. At age 12, Newton was reunited with his mother after her second husband died. She brought along her three small children from her second marriage. Newton had been enrolled at the King's School in Grantham, a town in Lincolnshire, where he lodged with a local apothecary and was introduced to the fascinating world of chemistry. His mother pulled him out of school, for her plan was to make him a farmer and have him tend the farm. Newton failed miserably, as he found farming monotonous. He soon was sent back to King's School to finish his basic education. Perhaps sensing the young man's innate intellectual abilities, his uncle, a graduate of the University of Cambridge's Trinity College, persuaded Newton's mother to have him enter the university. Newton enrolled in a program similar to a work-study in 1661, and subsequently waited on tables and took care of wealthier students' rooms. When Newton arrived at Cambridge, the Scientific Revolution of the 17th century was already in full force. The heliocentric view of the universe—theorized by astronomers Nicolaus Copernicus and Johannes Kepler, and later refined by Galileo—was well known in most European academic circles. Philosopher René Descartes had begun to formulate a new concept of nature as an intricate, impersonal and inert machine. Yet, like most universities in Europe, Cambridge was steeped in Aristotelian philosophy and a view of nature resting on a geocentric view of the universe, dealing with nature in qualitative rather than quantitative terms. During his first three years at Cambridge, Newton was taught the standard curriculum but was fascinated with the more advanced science. All his spare time was spent reading from the modern philosophers. The result was a less-than-stellar performance, but one that is understandable, given his dual course of study. It was during this time that Newton kept a second set of notes, entitled "Quaestiones Quaedam Philosophicae" ("Certain Philosophical Questions"). The "Quaestiones" reveal that Newton had discovered the new concept of nature that provided the framework for the Scientific Revolution. Though Newton graduated with no honors or distinctions, his efforts won him the title of scholar and four years of financial support for future education. Unfortunately, in 1665, the Great Plague that was ravaging Europe had come to Cambridge, forcing the university to close. Newton returned home to pursue his private study. It was during this 18-month hiatus that he conceived the method of infinitesimal calculus, set foundations for his theory of light and color, and gained significant insight into the laws of planetary motion—insights that eventually led to the publication of his Principia in 1687. Legend has it that, at this time, Newton experienced his famous inspiration of gravity with the falling apple. When the threat of plague subsided in 1667, Newton returned to Cambridge and was elected a minor fellow at Trinity College, as he was still not considered a standout scholar. However, in the ensuing years, his fortune improved. 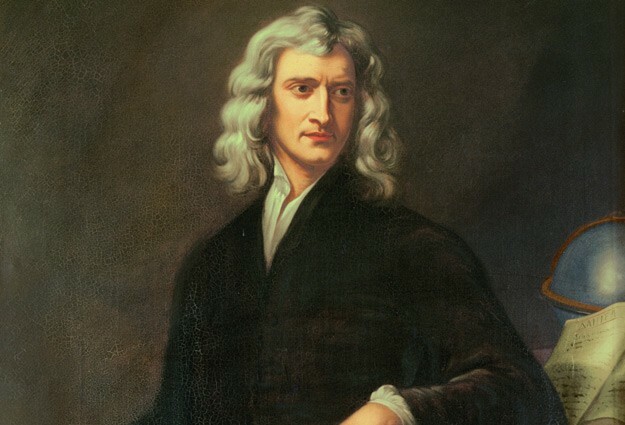 Newton received his Master of Arts degree in 1669, before he was 27. During this time, he came across Nicholas Mercator's published book on methods for dealing with infinite series. Newton quickly wrote a treatise, De Analysi, expounding his own wider-ranging results. He shared this with friend and mentor Isaac Barrow, but didn't include his name as author. In June 1669, Barrow shared the unaccredited manuscript with British mathematician John Collins. In August 1669, Barrow identified its author to Collins as "Mr. Newton ... very young ... but of an extraordinary genius and proficiency in these things." Newton's work was brought to the attention of the mathematics community for the first time. Shortly afterward, Barrow resigned his Lucasian professorship at Cambridge, and Newton assumed the chair. As a professor, Newton was exempted from tutoring but required to deliver an annual course of lectures. He chose to deliver his work on optics as his initial topic. Part of Newton's study of optics was aided with the use of a reflecting telescope that he designed and constructed in 1668—his first major public scientific achievement. This invention helped prove his theory of light and color. The Royal Society asked for a demonstration of his reflecting telescope in 1671, and the organization's interest encouraged Newton to publish his notes on light, optics and color in 1672; these notes were later published as part of Newton's Opticks: Or, A treatise of the Reflections, Refractions, Inflections and Colours of Light. However, not everyone at the Royal Academy was enthusiastic about Newton's discoveries in optics. Among the dissenters was Robert Hooke, one of the original members of the Royal Academy and a scientist who was accomplished in a number of areas, including mechanics and optics. In his paper, Newton theorized that white light was a composite of all colors of the spectrum, and that light was composed of particles. Hooke believed that light was composed of waves. Hooke quickly condemned Newton's paper in condescending terms, and attacked Newton's methodology and conclusions. Hooke was not the only one to question Newton's work in optics. Renowned Dutch scientist Christiaan Huygens and a number of French Jesuits also raised objections. But because of Hooke's association with the Royal Society and his own work in optics, his criticism stung Newton the worst. Unable to handle the critique, he went into a rage—a reaction to criticism that was to continue throughout his life. Newton denied Hooke's charge that his theories had any shortcomings, and argued the importance of his discoveries to all of science. In the ensuing months, the exchange between the two men grew more acrimonious, and soon Newton threatened to quit the society altogether. He remained only when several other members assured him that the Fellows held him in high esteem. However, the rivalry between Newton and Hooke would continue for several years thereafter. Then, in 1678, Newton suffered a complete nervous breakdown and the correspondence abruptly ended. The death of his mother the following year caused him to become even more isolated, and for six years he withdrew from intellectual exchange except when others initiated correspondence, which he always kept short. During his hiatus from public life, Newton returned to his study of gravitation and its effects on the orbits of planets. Ironically, the impetus that put Newton on the right direction in this study came from Robert Hooke. In a 1679 letter of general correspondence to Royal Society members for contributions, Hooke wrote to Newton and brought up the question of planetary motion, suggesting that a formula involving the inverse squares might explain the attraction between planets and the shape of their orbits. Subsequent exchanges transpired before Newton quickly broke off the correspondence once again. But Hooke's idea was soon incorporated into Newton's work on planetary motion, and from his notes it appears he had quickly drawn his own conclusions by 1680, though he kept his discoveries to himself. In early 1684, in a conversation with fellow Royal Society members Christopher Wren and Edmond Halley, Hooke made his case on the proof for planetary motion. Both Wren and Halley thought he was on to something, but pointed out that a mathematical demonstration was needed. In August 1684, Halley traveled to Cambridge to visit with Newton, who was coming out of his seclusion. Halley idly asked him what shape the orbit of a planet would take if its attraction to the sun followed the inverse square of the distance between them (Hooke's theory). Newton knew the answer, due to his concentrated work for the past six years, and replied, "An ellipse." Newton claimed to have solved the problem some 18 years prior, during his hiatus from Cambridge and the plague, but he was unable to find his notes. Halley persuaded him to work out the problem mathematically and offered to pay all costs so that the ideas might be published. In 1687, after 18 months of intense and effectively nonstop work, Newton published Philosophiae Naturalis Principia Mathematica (Mathematical Principles of Natural Philosophy). Said to be the single most influential book on physics and possibly all of science, it is most often known as Principia and contains information on nearly all of the essential concepts of physics, except energy. The work offers an exact quantitative description of bodies in motion in three basic laws: 1) A stationary body will stay stationary unless an external force is applied to it; 2) Force is equal to mass times acceleration, and a change in motion is proportional to the force applied; and 3) For every action, there is an equal and opposite reaction. These three laws helped explain not only elliptical planetary orbits but nearly every other motion in the universe: how the planets are kept in orbit by the pull of the sun’s gravity; how the moon revolves around Earth and the moons of Jupiter revolve around it; and how comets revolve in elliptical orbits around the sun. The laws also allowed Newton to calculate the mass of each planet, calculate the flattening of the Earth at the poles and the bulge at the equator, and how the gravitational pull of the sun and moon create the Earth’s tides. In Newton's account, gravity kept the universe balanced, made it work, and brought heaven and earth together in one great equation. Upon the publication of the first edition of Principia, Robert Hooke immediately accused Newton of plagiarism, claiming that he had discovered the theory of inverse squares and that Newton had stolen his work. The charge was unfounded, as most scientists knew, for Hooke had only theorized on the idea and had never brought it to any level of proof. However, Newton was furious and strongly defended his discoveries. He withdrew all references to Hooke in his notes and threatened to withdraw from publishing the subsequent edition of Principia altogether. Halley, who had invested much of himself in Newton's work, tried to make peace between the two men. While Newton begrudgingly agreed to insert a joint acknowledgement of Hooke's work (shared with Wren and Halley) in his discussion of the law of inverse squares, it did nothing to placate Hooke. As the years went on, Hooke's life began to unravel. His beloved niece and companion died the same year that Principia was published, in 1687. As Newton's reputation and fame grew, Hooke's declined, causing him to become even more bitter and loathsome toward his rival. To the bitter end, Hooke took every opportunity he could to offend Newton. Knowing that his rival would soon be elected president of the Royal Society, Hooke refused to retire until the year of his death, in 1703. Principia immediately raised Newton to international prominence, and he thereafter became more involved in public affairs. Consciously or unconsciously, he was ready for a new direction in life. He no longer found contentment in his position at Cambridge and he was becoming more involved in other issues. He helped lead the resistance to King James II's attempts to reinstitute Catholic teaching at Cambridge, and in 1689 he was elected to represent Cambridge in Parliament. While in London, Newton acquainted himself with a broader group of intellectuals and became acquainted with political philosopher John Locke. Though many of the scientists on the continent continued to teach the mechanical world according to Aristotle, a young generation of British scientists became captivated with Newton's new view of the physical world and recognized him as their leader. One of these admirers was Nicolas Fatio de Duillier, a Swiss mathematician whom Newton befriended while in London. However, within a few years, Newton fell into another nervous breakdown in 1693. The cause is open to speculation: his disappointment over not being appointed to a higher position by England's new monarchs, William III and Mary II, or the subsequent loss of his friendship with Duillier; exhaustion from being overworked; or perhaps chronic mercury poisoning after decades of alchemical research. It's difficult to know the exact cause, but evidence suggests that letters written by Newton to several of his London acquaintances and friends, including Duillier, seemed deranged and paranoiac, and accused them of betrayal and conspiracy. Oddly enough, Newton recovered quickly, wrote letters of apology to friends, and was back to work within a few months. He emerged with all his intellectual facilities intact, but seemed to have lost interest in scientific problems and now favored pursuing prophecy and scripture and the study of alchemy. While some might see this as work beneath the man who had revolutionized science, it might be more properly attributed to Newton responding to the issues of the time in turbulent 17th century Britain. Many intellectuals were grappling with the meaning of many different subjects, not least of which were religion, politics and the very purpose of life. Modern science was still so new that no one knew for sure how it measured up against older philosophies. In 1696, Newton was able to attain the governmental position he had long sought: warden of the Mint; after acquiring this new title, he permanently moved to London and lived with his niece, Catherine Barton. She was the mistress of Lord Halifax, a high-ranking government official who was instrumental in having Newton promoted, in 1699, to master of the Mint—a position that he would hold until his death. Not wanting it to be considered a mere honorary position, Newton approached the job in earnest, reforming the currency and severely punishing counterfeiters. As master of the Mint, Newton moved the British currency, the pound sterling, from the silver to the gold standard. In 1703, Newton was elected president of the Royal Society upon Robert Hooke's death. In 1705, he was knighted by Queen Anne of England. By this point in his life, Newton's career in science and discovery had given way to a career of political power and influence. Newton never seemed to understand the notion of science as a cooperative venture, and his ambition and fierce defense of his own discoveries continued to lead him from one conflict to another with other scientists. By most accounts, Newton's tenure at the society was tyrannical and autocratic; he was able to control the lives and careers of younger scientists with absolute power. In 1705, in a controversy that had been brewing for several years, German mathematician Gottfried Leibniz publicly accused Newton of plagiarizing his research, claiming he had discovered infinitesimal calculus several years before the publication of Principia. In 1712, the Royal Society appointed a committee to investigate the matter. Of course, since Newton was president of the society, he was able to appoint the committee's members and oversee its investigation. Not surprisingly, the committee concluded Newton's priority over the discovery. That same year, in another of Newton's more flagrant episodes of tyranny, he published without permission the notes of astronomer John Flamsteed. It seems the astronomer had collected a massive body of data from his years at the Royal Observatory at Greenwich, England. Newton had requested a large volume of Flamsteed's notes for his revisions toPrincipia. Annoyed when Flamsteed wouldn't provide him with more information as quickly as he wanted it, Newton used his influence as president of the Royal Society to be named the chairman of the body of "visitors" responsible for the Royal Observatory. He then tried to force the immediate publication of Flamsteed's catalogue of the stars, as well as all of Flamsteed's notes, edited and unedited. To add insult to injury, Newton arranged for Flamsteed's mortal enemy, Edmund Halley, to prepare the notes for press. Flamsteed was finally able to get a court order forcing Newton to cease his plans for publication and return the notes—one of the few times that Newton was bested by one of his rivals. Toward the end of this life, Newton lived at Cranbury Park, near Winchester, England, with his niece, Catherine (Barton) Conduitt, and her husband, John Conduitt. By this time, Newton had become one of the most famous men in Europe. His scientific discoveries were unchallenged. He also had become wealthy, investing his sizable income wisely and bestowing sizable gifts to charity. Despite his fame, Newton's life was far from perfect: He never married or made many friends, and in his later years, a combination of pride, insecurity and side trips on peculiar scientific inquiries led even some of his few friends to worry about his mental stability. By the time he reached 80 years of age, Newton was experiencing digestion problems, and had to drastically change his diet and mobility. Then, in March 1727, Newton experienced severe pain in his abdomen and blacked out, never to regain consciousness. He died the next day, on March 31, 1727, at the age of 84. Isaac Newton's fame grew even more after his death, as many of his contemporaries proclaimed him the greatest genius who ever lived. Maybe a slight exaggeration, but his discoveries had a large impact on Western thought, leading to comparisons to the likes of Plato, Aristotle and Galileo. Although his discoveries were among many made during the Scientific Revolution, Isaac Newton's universal principles of gravity found no parallels in science at the time. Of course, Newton was proven wrong on some of his key assumptions. In the 20th century, Albert Einstein would overturn Newton's concept of the universe, stating that space, distance and motion were not absolute but relative, and that the universe was more fantastic than Newton had ever conceived. Newton might not have been surprised: In his later life, when asked for an assessment of his achievements, he replied, "I do not know what I may appear to the world; but to myself I seem to have been only like a boy playing on the seashore, and diverting myself now and then in finding a smoother pebble or prettier shell than ordinary, while the great ocean of truth lay all undiscovered before me."